At present, dialing an international call will not cost you a single penny from your pocket. You just need help from a host device and a strong internet connection, and make free calls to Spain, anytime. There are some leading software tools available over the internet, which help you to make calls free of cost. You are free from registering your name on the website and start making calls. The best part is that you are not restricted to make calls from your personal computer. You can now make calls from the smartphone or tablet, as well. As the services are now responsive in design, therefore, you can make a call while on the go. 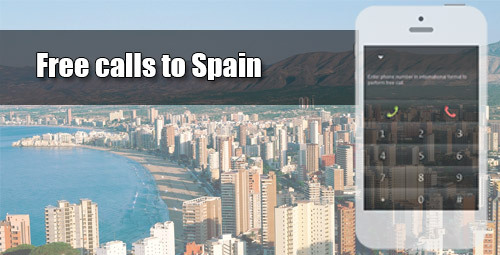 With the help of reliable software, you are now able to make free calls to Spain in any landline number or smartphones. Moreover, these services are meant for all and not any particular sect of society. With the help of this web browser technology, making calls has never been easier! You are free from taking help of any additional plug-in resources. It means, for using this web browser, you just have to type the URL in the top bar and press enter. On the other hand, as this is a free service, therefore, this web browser will not avail any credit card details from the users, as well. The web browser is extremely easy to understand, thanks to its simple design. As the area is free from any sluggish design, therefore, you can easily type the number and press the green calling button to make a call. Incorporate the speaker with your system, and you are goo to make a call. Once you are done with the call, click on the red cancel button, and your call will end immediately. The website is designed in such a manner so that it seems, you are dialing a number from your smartphone. Most of the websites will disturb you with advertisement pop-ups, distracting you from your current work. With the help of this web browser, you are free from any marketing hype, as such. Now, you can make any calls to Spain uninterruptedly, as you are free from any advertisement pop-ups. It is extremely easy to make a call over here, as you just have to dial a number, just like from your mobile phones. As you are free from registering, therefore, just click on the website link and start making the call immediately. iEvaphone is a one-stop solution for you while planning to make free calls to Spain. This is a perfect web browser, which is free from additional plug-in and registration. The website is free from any registration procedure. It means you can dial up your number from this website, just like working on your phone. Just make sure to use the right international format while making the call, and leave the rest to this professional web browser. iEvaphone will not ask for any credit card details, as well. Our website automatically inserts the country code when selecting the required country from the list.